Today I take a break from the normal professional-related posts to post something personal. Last week many of us were fortunate enough to be able to spend Thanksgiving with our family and friends. I certainly am one of those among the fortunate. That fact notwithstanding, Misha and I still need your help. It is wonderful that Misha remains at home and that we were able to spend Thanksgiving together. However, he is home because the insurance company – Aetna – refuses to provide coverage for his necessary additional stay at a rehabilitation facility. Aetna also does not provide coverage for the home care attendant who is helping Misha with his activities of daily living, the cost of which exceeds TWELVE THOUSAND DOLLARS monthly. Yes, the cost for a home care attendant exceeds $12,000 MONTHLY! It is because of your generosity that we have been able to make these payments so far and we are so thankful for your support. Today, on this Giving Tuesday, we ask for your continued help – your financial help – to pay for the ongoing care that Misha needs and that our insurance company, Aetna, does not provide. We truly appreciate your support. To give, please visit our GoFundMe site, or contact me for a direct mailing address. Thank you! The Middlebury College bookstore doesn’t look much like a bookstore anymore. The textbooks that once lined its shelves were cleared out earlier this year, making room for more Middlebury-branded sweatshirts, T-shirts and coffee mugs. The bookstore, like many others at colleges across the country, had suffered from declining sales and stiff competition from large online retailers such as Amazon. Bookstore manager Erin Jones-Poppe said it simply didn’t make sense for the store to keep stocking books. "We cannot afford to continue in our current trajectory," she told the student newspaper, The Middlebury Campus, in 2017. Last spring the bookstore switched to an online-only book ordering system, offered through MBS Textbook Exchange — a company that was acquired by Barnes and Noble Education in 2017. Under the new system, students can still pick up their books from the bookstore — they just have to order them online first. The system is supposed to provide better value for students. But faculty members at Middlebury say they want the old system back. Students won’t order books in advance of their first classes because they are unsure of their schedules, the professors wrote. When the students do order their books, it can take up to three weeks for them to arrive. To get the books to arrive faster “costs our students extortionate amounts in shipping costs,” they said. Since the system changed, many more students have shown up to class without their books, he said. Antonia Losano, a lead author of the letter and chair of the Department of English and American Literature, said after the letter was published numerous members of the college administration got in touch to “express concern and commitment to working on this.” Many members of the administration also teach regularly, so this is “not an abstract issue to them,” she said. A spokeswoman for Middlebury College declined to comment while discussions between faculty, staff and administrators are ongoing. Losano said a meeting between the relevant parties has been scheduled for mid-November. Bill Dampier, executive vice president of MBS Textbook Exchange, said he "understood the concerns of Middlebury faculty" and would be working with the college "to ensure students have access to the materials they need for success in the classroom." Students who buy directly from MBS’s inventory are offered a low rate on second-day air shipping, or they can pick up their purchase from the Middlebury bookstore without any shipping cost, said Dampier. However, many students at Middlebury chose to purchase their books from individual sellers in the MBS marketplace — where items are shipped by the seller and not by MBS, often at lower cost. "It is clearly stated on the website at the point of purchase that the shipping window can be up to 18 days," said Dampier. Middlebury College is not alone in eliminating books from its bookstore in recent years. Robert Batyko, social media and digital manager of the National Association of College Stores, said a few hundred institutions have moved course material ordering and delivery online. Nearly all the others do some combination of both online and physical textbook ordering and delivery, he said. Institutions that move book sales online "generally do so in response to the increasing number of students who purchase online, and increasing usage of digital materials," said Batyko. "Additionally, some institutions have moved in this direction for financial reasons, as it allows them to repurpose the space for other offerings." Going online-only is "complex, and if not well executed, susceptible to difficulties," said Batyko. "The most common complaints center around delays in the ordering and delivery of course materials, along with the shipping fees." Colby-Sawyer College in New Hampshire switched to an online-only ordering system from MBS in 2016. Administrators at Colby-Sawyer initially “got a tiny bit of pushback” from faculty who didn’t like the new system, said Beth Crockford, chair of the business administration department. “It was a challenge for a few faculty members, but now that we are used to it, I have not heard complaints,” she said. The MBS system allows students to buy used, new or digital books, and offers to buy back print textbooks once students are done with them. “It’s a wise business move for small schools,” said Alison Seward, manager of the Colby-Sawyer college store. The system might not be perfect, but she wouldn’t go back to putting books on the shelves. “I vote to keep the online ordering system,” she said. The Middlebury College bookstore, when its shelves held textbooks. Last week saw another national discussion over the racist nature of blackface after Megyn Kelly defended it on her now-defunct NBC show as something other than racist and as appropriate for Halloween costumes. For higher education, discussions of blackface are hardly new, but the reality is that students and others continue to appear in blackface, to the frustration not only of black students and faculty members, but many educators. At Brigham Young University last week, the university was holding a symposium (in collaboration with historically black Morgan State University) on the 50th anniversary of the report of the National Advisory Commission on Civil Disorders, known as the Kerner Commission. But even as the university focused resources on that event, word spread on campus that a white student had appeared at a Halloween party in blackface. Many students were shocked, and black students (about 1 percent of the student body) were reported to be particularly upset. The student was part of the communications school at Brigham Young, which was coordinating the Kerner symposium’s focus on press coverage of the events of a half century ago. Edward L. Carter, director of the communications school, said he had several meetings Thursday and Friday with students upset about the blackface incident, and with the student who wore blackface. Carter via email said that the student has apologized via a Slack group to communications students, but that the issue is not over. In a letter he sent to students and faculty members, Carter said that wearing blackface was inconsistent with the values of the university, which involve respect for all. He also said he and others would "be working with the student who wore the costume. While I am reserving judgment on the outcome, I will say that this kind of behavior appears to be out of line with the School’s Professionalism Statement and that repercussions could include warning, suspension or removal from the communications major." While the use of blackface is almost always condemned by leaders of the colleges involved, many times it is not formally punished, in particular at public institutions, where it is viewed as a form of free expression, however offensive it may be. 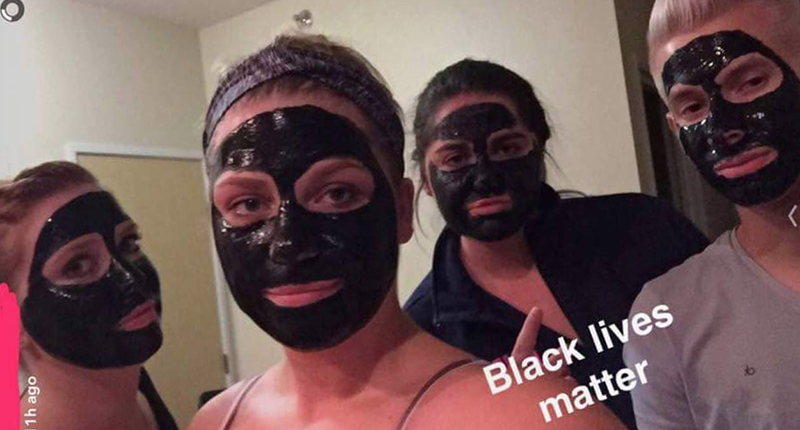 Most of the blackface incidents become public because students not only wear blackface, but post photographs of themselves on social media, such as the image at right featuring University of North Dakota students. While many colleges and universities discourage students from wearing costumes that make fun of people’s race or ethnicity, most of those actions by colleges are a matter of discouraging, not banning, which probably wouldn’t be legal at public institutions. But a constant meme among those who consider themselves warriors against political correctness is that colleges have "costume police" who regulate costumes. And that’s how Kelly started off her show last week, repeatedly saying that the student union at University of Kent, in Britain, was trying to "ban" certain costumes. The university press office said that there is no policy at Kent about costumes. What Kelly was reacting to was a draft of recommendations being considered by the student union to encourage students not to offend in their costume choices. But Kelly was apparently quoting from the draft and didn’t note that Kent students ultimately are making their own choices about costumes. The Kent Union issued this explanation of why it is drafting recommendations for students ("fancy dress" is a Britishism for "costume"): "Over the past few years we have witnessed incidents where student groups have worn inappropriate fancy dress clothing which has caused offense to some of our students at our university. Our values as a union are to be bold, inclusive and supportive and therefore it is a priority for us to promote an inclusive campus and to be respectful of all students, taking into account their lived experiences and points of view and that is what we should be focusing on here. "We are being proactive in looking out for all students whilst empowering them to have a great time at Kent and this is the narrative which is seemingly being missed in the headlines. We are aware that students generally have an understanding of these issues, and most fancy dress events are not problematic, but we believe it is important to raise awareness of potentially problematic themes and work with our student groups to ensure successful student run events." When we faculty members from underrepresented groups assume our first tenure-track position, our more experienced academic colleagues quickly tell us to avoid too much service before earning tenure. They warn us that the service demands will be greater on us because we are members of underrepresented groups and that we must find ways to balance participation in our university communities with learning to say no. After several years on the tenure track at a major research university, I have learned that, in some ways, such advice could not be more accurate. The demands on us are certainly greater, yet service work often gains scant praise at annual review time. If your research agenda is not on track, the many nights you did not get home until 10 p.m. because you served on a panel or attend a student event do not matter much. But it is also true that faculty members from underrepresented groups are filling crucial needs on campus when they “choose” to become involved in various forms of service. Those needs exist not only because few people like us are on the campus, but also because we often work with those who don’t treat campus diversity issues with the seriousness that such issues deserve. Diversify your professional networks. Whether or not it is for a speaker series, a job search or student recruitment, universities’ efforts at diversity and inclusion often fail because faculty who are not members of underrepresented groups do not have a network that includes a large number of underrepresented scholars or students. As a result, they seem to be less likely to generate diverse pools for key institutional events and activities. The burden, once again, falls on members of underrepresented groups to point out that the speakers on the conference panel or the interview finalists are all white and male. When pools are not diverse, it also means numbers of faculty from underrepresented groups will remain small, increasing our feelings of isolation and alienation. Thus, you should take time to learn about the work of scholars from underrepresented groups in your field. For example, go to conferences that high numbers of scholars from underrepresented groups usually attend (e.g. the Association of Black Sociologists, the Association for the Study of African American Life and History). Many of these conferences are designed to ensure that scholars from underrepresented groups have spaces to convene, network and gain support, but that should not stop you from attending panels and taking time to get to know the work of students and faculty members whom you can recruit to your university. Once you do this, you will find that while there are fewer scholars from diverse backgrounds, there are enough to diversify your speaker series or job-applicant pool. See diversity as an asset. Research on organizations has shown that diversity can provide a number of important benefits. For example, companies with more diversity have been found to be more profitable, because more diverse teams in workplaces can be more innovative when conducting various tasks. When I look at my own field, most of those programs consistently ranked in the top 10 have more than one faculty member from an underrepresented group. They also have more than one or two graduate students from underrepresented groups. That undoubtedly fuels their ability to produce innovative research and to constantly draw interest from students and scholars around the world. So fostering diversity at your university is not simply a way to pacify disgruntled groups or a way to resolve liberal guilt. Instead, diversity improves the quality of the university. Your department, program or area of the campus will be limited in how successful it can be if it is not composed of a representative group of people. Get to know your campus differently, especially if you are tenured. Students from diverse backgrounds often ask faculty members from underrepresented groups to be on panels or to advise projects because they are looking for mentorship from individuals with similar backgrounds. But that isn’t always the case. Sometimes, we are just the only faculty members whom they find visible and approachable. Students are often excited about meeting with faculty members from a variety of backgrounds who simply show interest in what they are doing and make an effort to understand their college experiences. If you attend events hosted by students from underrepresented groups and spend more time in student spaces, those students will see they can connect with you and other faculty members. That’s particularly helpful if you’ve already earned tenure and can spare a few more hours a week than your junior colleagues who are desperately trying to respond to various student requests while finishing research requirements for their tenure packages. It will also improve the campus climate — which, in turn, improves recruitment and retention efforts. Perhaps most important, treat diversity and inclusion efforts with the urgency that you treat other institutional issues. When the final lists of candidates for a job search, admitted graduate students and campus colloquium speakers somehow contain no scholars from underrepresented groups, consider the points I’ve made. A lack of diversity has a lasting impact on the campus — from the quality of life for students and faculty members to the ultimate success of the institution. Instead of falling back on old, tired excuses — like you were simply unable to find good candidates — act with an urgency that ensures your university remains a competitive, nationwide leader. What type of leader are you? What is your purpose, and who do you serve? Some new research about leaders’ mindsets examines assumptions and beliefs about the nature and purpose of leadership—and how to make the most of it.